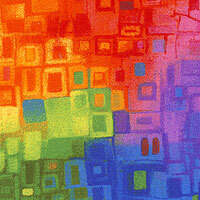 Larger shapes are about 5", from the 'Abstract Collage' collection by Ampersand of Paintbrush Studio for Fabri-Quilt. "I have to tell you that you, your store, and your products are amazing!! I especially loved the gift wrapping!! You have got a life-long customer!! Happy Quilting & God Bless you!!" "Thank you for you excellent service. I just love getting my parcels. I just love browsing your site and always seem to find the right fabrics for my projects Thank you kindly!" "Dear Luana, I just received my first shipment of fabric from your company and I can't wait to get started on my quilting project. I ran across your website ad in Threads magazine and..."
"I put in an order Monday and the mail man brought it today!!! Again, it is prettier than what shows on the computer screen. Can't wait to start the St. Patrick quilt. I also love..."